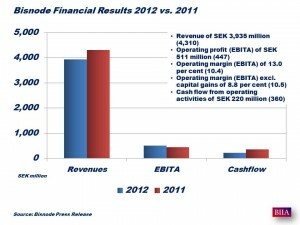 Bisnode reported 4th Quarter 2012 revenues of SEK 1,051 million, a decline of 9.8%. Operating income increased to SEK 125 million, up 18% from prior year period. Operating margin improved to 12.2% up from 9.1% from prior year. For the full year Bisnode’s revenues were SEK 3,935 million, a decline of 7%. Operating income increased to SEK 511 million, up 14% from prior year period. Operating margin improved to 13% up from 10.5%. The company stated that a far-reaching process of change is being implemented in order to create a ”One Bisnode”. Organic growth was 1%. Bisnode sustained healthy growth and earnings trend in Credit Solutions but continued weak development for the companies in Marketing Solutions. Bisnode signed a new 10-year strategic partnership agreement with Dun & Bradstreet International for 11 markets signed at the beginning of August 2012. Bisnode expects to divest all remaining business units providing Product Information. The company will continue to focus on information solutions and analytics which can be imbedded in customers’ workflow.